Asad is a fisher boy in Somalia. His friends, led by Laban, are pirates; Asad feels as if he is suited for the pirate life. An old fisherman named Erasto would rather he stick to an honest fishing life as opposed to piracy. Asad has never been able to catch anything on his fishing trips and is beginning to give up hope. Erasto tries to lift his spirits with his largest catch of the day. When Asad is taking home the fish with his friend various people on the street ask if he has caught it and he angrily tells them that he has not. His friend suggests that he should lie but Asad says that if he does he will be cursed forever and won't catch anything. As they are talking they run into a group of Somali rebels that ask where all the beautiful women in their town are. When Asad's friend says he does not know they threaten to kill him; Asad offers them the fish to save his friend's life. The next day Asad goes out to the sea to meet with Erasto for a fishing trip and sees the old man injured by the boat. Since Asad had mentioned where the fish came from, the Somali rebels had come for him. Erasto's arm was so badly injured that he could not fish. He tells Asad that the boy's luck will change today and he will finally catch something. Asad feels the tug of a fish when out at sea and tries to pull it in, but it instead pulls his boat out farther into the sea, where he spies a luxury boat similar to the one that Laban and his friends were going to hold for ransom. Asad goes to see what happened and finds Laban, his friends, and the woman who had the boat all dead. He begins to inspect another room and finds a Persian cat, which he brings back to Erasto. Neither of them know what a cat is, but they say that it looks like a white lion. Erasto marks that Asad's name means "lion". Asad names the cat Lionfish and takes it back to his village to take care of, his luck changed. Saïd, Jordan. "Asad (2012)." 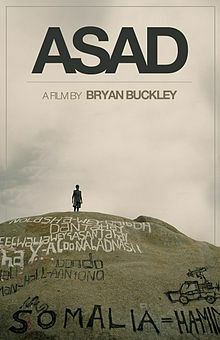 : Asad (2012). Turban Decay18, 18 Oct. 2013. Web. 04 Dec. 2014. The film also has its own website which can be accessed here.